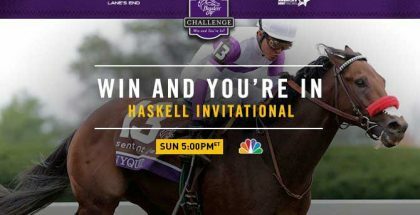 A Haskell For The Ages by Jordan Sigmon: With the surprise mid-week addition of Preakness winner Exaggerator, the 49th running of the Grade I Haskell Invitational was poised to be a great one as it had attracted not only Exaggerator but Kentucky Derby winner Nyquist, setting up a rematch that was dubbed “The Showdown at the Shore”. On Thursday when post positions were drawn, a compact but talented field showed up. While the big two drew the rail (Nyquist) and the far outside (Exaggerator), in between them were the upstart American Freedom and Louisiana Derby winner Gun Runner along with Sunny Ridge and Awesome Slew. The Curlin colt Exaggerator blew straight by the other three Haskell leaders and powered home to a 1 ½ length score, eased up under the wire. Many of the top handicappers quickly wrote off Exaggerator because the colt was originally supposed to run in the Grade II Jim Dandy at Saratoga but two poor works over that surface led trainer Keith Desormeaux to call an audible and reroute his Classic-winning son of Curlin. Some think Desormeaux had a little weatherman in him when devising this plan because forecasts called for rain, and lots of it. As we saw in both the Santa Anita Derby and Preakness this year, as well as the Delta Downs Jackpot last year, Exaggerator loves the mud. Low and behold he got just that on Sunday, a sloppy track. There was some slight drama earlier in the afternoon, as the silks for the Derby winner Nyquist had not arrived at Monmouth and the thought was he would have to borrow somebody else’s silks. Luckily the silks arrived just in time, with a little over 30 minutes to spare. Good omen or not, all signs were pointing to a stellar performance from Nyquist. Come post time Nyquist was the 4/5 favorite over Exaggerator who was listed at 5/2. From the rail, Nyquist had no choice but to send out of the gate, a move that caught him dueling with American Freedom in an opening quarter mile in 22.78 and a half in 46.62. 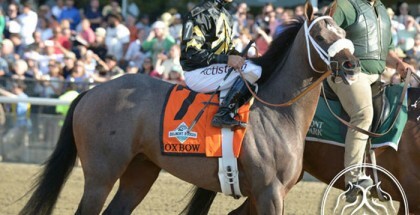 At this point, American Freedom gained a slight edge over the big favorite. After three-quarters in 1:11.00 Nyquist was beginning to re-rally, but Exaggerator was looming menacingly behind the leaders. 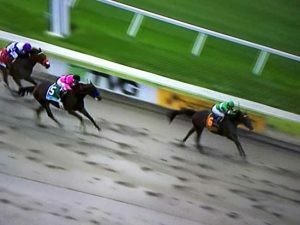 They turned into the stretch and Nyquist, American Freedom, Gun Runner, and Exaggerator had all lined up on the lead, mid=stretch it looked as if Nyquist was coming back, but there was Exaggerator on the outside widest of all. 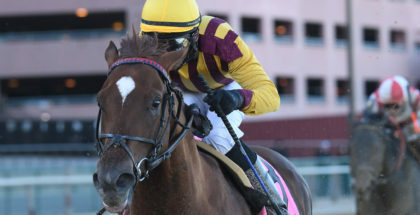 The Curlin colt blew straight by the other three leaders and powered home to a 1 ½ length score, eased up under the wire. American Freedom hung on for 2nd while Sunny Ridge rallied on for 3rd a neck ahead of Nyquist; Gun Runner and Awesome Slew completed the order of finish. The final time for the 1 1/8-mile journey was 1:48.70. Trainer Bob Baffert indicated that he was very pleased with his colt and noted the Travers as a distinct possibility as the next start for the son of Pulpit, who will ship back to California in the coming days. Assistant trainer Julie Clark emphasized the confidence they had in the horse going into the race and indicated that Exaggerator would ship back to his summer base at Saratoga on August 1st in advance of a likely start in the G1 Travers Stakes on August 27th. Bred in Kentucky by Joseph Murphy, Exaggerator is by Curlin out of Dawn Raid (Vindication). The dark bay colt was purchased for $110,000 at the 2014 Keeneland September Yearling Sale and races for Big Chief Racing, Head of Plains Partners, and Rocker O Ranch. He has compiled earnings of just under $3.6 million in 13 career starts with 6 wins, 3 seconds, and a third.